Understanding the potential impact of climate change on the Gulf, from a scientific perspective, is not a simple exercise. First, much of what we know about climate change is averaged over a global scale. Understanding what an average increase of 2-4 degrees C over the next 100 years, as predicted by the Intergovernmental Panel on Climate Change (IPCC), means for the Gulf is complicated by the fact that the polar regions are warming faster than the equator. Furthermore, the transfer of heat from the atmosphere to the ocean varies considerably depending on currents, tides, and winds. 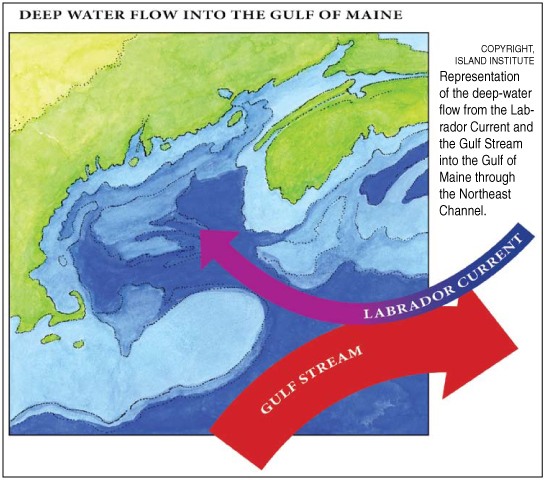 In the Gulf of Maine, climate scientists believe that warming due to increasing air temperatures will be somewhat offset by increased flow of cold Labrador Current water into the Gulf as the rate of Arctic sea ice melting increases. The Union of Concerned Scientists has estimated that the Gulf of Maine will warm as much as 1-2 degrees C over the next 70 years. However, much work remains to be done before models can reliably predict what a warming atmosphere will mean for the Gulf of Maine. Setting aside predictions of future change, do we see any evidence of recent warming in the Gulf, now that we know that climate change has been underway for years, if not decades? Until recently the data has been conflicting. 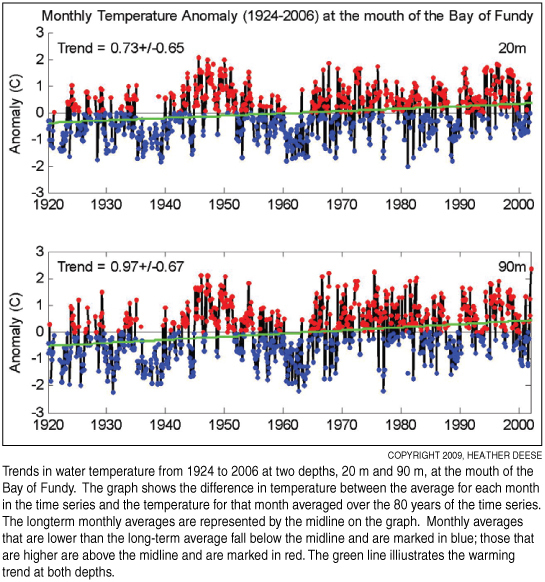 Some studies have shown that the Gulf has actually been cooling over the past few years. The problem is compounded by the fact that comprehensive data on water temperature, from satellites and buoy-based sensors, are relatively recent. Only a handful of data sets go back far enough to allow for analysis of long-term trends. Deese looked at data from a monitoring site in the southwestern Bay of Fundy that has been monitored by the Canadian Department of Fisheries and Oceans since 1924. “My latest results indicate that water temperatures have warmed over the past nearly 100 years, a trend that is likely the result of climate change,” said Deese. Is the ecosystem responding to temperature change that has already occurred? Researchers at the Island Institute, a non-profit based in Rockland, Maine, tackled this issue by tapping into the extensive ecological knowledge accumulated by fishermen. They asked lobster fishermen if they had observed any changes in the fishery or marine environment that might be attributable to climate change. 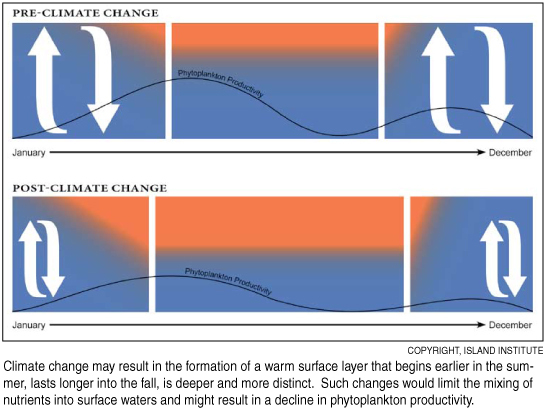 Like the climate change signal itself, the ecological effects of climate change can be difficult to discern from those of other factors such as fishing pressure, habitat loss, and pollution. The results of the interviews were surprising: fishermen identified distinct changes in lobster behavior that may be related to climate change. The timing of the shed, that moment in early summer when masses of soft-shelled lobsters recruit into the fishery after molting, has changed. Fishermen report that the shed used to be very predictable. In mid-coast Maine, for example, they could count on the shedders arriving just in time to meet Fourth of July holiday demand. But for the last eight to 10 years, the shed has become much less predictable. Shedders arrive earlier than expected—or occasionally later. “Why are we catching shedders in March, April, May and June?” asked Gerry Cushman, fisherman from Port Clyde, Maine. Variability in the shed may reflect the increased variability in annual weather patterns that climate scientists tell us are one consequence of climate change. 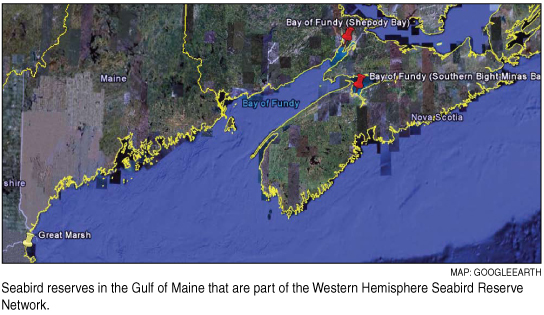 Increased rainfall and a shift in snow melt to earlier in the spring may also be resulting in changes in freshwater inputs to the Gulf of Maine, altering salinity. Changes in the shed might be a result as lobsters are sensitive to changes in salinity. Sometimes the shed is less of a “spurt,” the term fishermen use for a sudden wave of increased catches, with the shedders instead trickling in over a several week period. Later in the season, fishermen are finding that lobsters are moving into deeper water, part of their annual migration inshore and off again, much earlier than usual. “The places I fish in August are the places we used to fish in October,” said Jim Wotton of Friendship, Maine. Gillian Garratt-Reed, marine program manager at the Island Institute, said her project will next consider unusual organisms the fishermen report finding in their traps. Shorebirds may be like the canary in the mine shaft when it comes to the ecological consequences of climate change. The semipalmated sandpiper, a tiny shorebird that passes through the Gulf of Maine by the thousands on its fall migration from the Arctic to South America, is highly sensitive to changes in its foraging areas. “Seventy percent of the world’s population of this species visits the mudflats of the Bay of Fundy, stocking up on tiny amphipods that live in intertidal sediments,” explained Charles Duncan, director of the Shorebird Recovery Project for the Manomet Center for Conservation Sciences, based in Manomet, Massachusetts. Duncan manages the Western Hemisphere Shorebird Reserve Network, a system of more than 70 sites designed to protect the far-flung habitat of these peripatetic creatures. Three sites in the Gulf of Maine are part of the network: Shepody Bay in New Brunswick, Minas Basin in Nova Scotia and Great Marsh in Massachusetts. These sites could be affected by climate change in three ways, said Duncan. First, rising sea level may outpace the ability of the mud flats to migrate inland – if development on land allows them any room to move at all. Second, rising water temperatures may affect the sandpipers’ prey. Particularly troubling to Duncan is the possible “uncoupling of the chronology of migration and the appearance of the birds’ food supplies.” This could happen if the many elements of the food web do not respond to climate change in lockstep and he believes it is unlikely that they will. 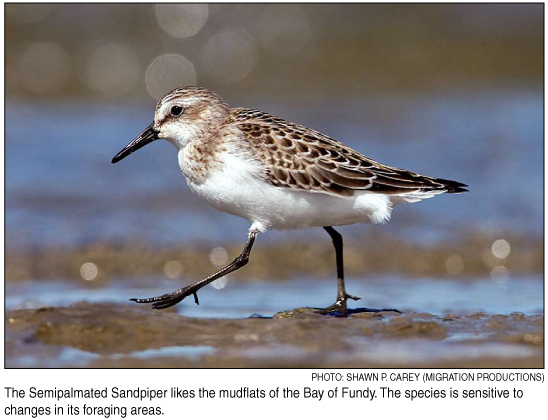 Finally, invasive species and new diseases may create new challenges for the sandpipers. Other shorebirds are also at risk. Piping plovers and least terns, which nest on the beaches of the Gulf of Maine, have been fighting an ongoing battle against increasing recreational activity and development along the coast. Sea level rise adds a new degree of difficulty to the protection of these species. The Gulf of Maine may be the only New World wintering ground for the purple sandpiper. Ominously, the red-necked phalarope, which once fed by the thousands on the flats of the Bay of Fundy, disappeared from the area 20 years ago in a mystery still unsolved by ornithologists. “Seabirds are exquisitely vulnerable to climate change,” noted Hector Galbraith, who oversees Manomet’s Climate Change Initiative. As scientists work to grasp the meaning of climate change for the Gulf of Maine, decision-makers in the states and provinces are identifying effective policy responses. Some responses tackle mitigation: how can we reduce greenhouse gas emissions to slow and eventually reverse climate change? Nova Scotia released its 2009 Energy and Climate Change Action Plan earlier this year. The plan, similar to others in the region, calls for a cap on emissions, increased renewable energy and improvements in energy efficiency. In New Brunswick, the province’s Climate Change Action Plan explains that New Brunswick-led initiatives will reduce greenhouse gas emissions by 2012. Other proposed policies address adaptation. Due to the delayed effect of greenhouse gases on climate change, the planet will be subject to several decades of warming—and would be even if all greenhouse gas emissions were eliminated today. Natural Resources Canada is stressing the importance of adaptation to climate change in Atlantic Canada. Among its efforts is the identification of shoreside trails and boardwalks. These amenities are important for both tourism and recreation, and both are at risk from the potential impacts of climate change, including a projected increase in storm intensity and frequency as well as sea level rise. The agency has identified strategies for protecting these points of access to the coast and has produced an attractive and user-friendly brochure to get the word out to coastal communities. The focus was very much on adaptation at the climate change symposium in Boston. Speakers at the meeting, organized by the New England Aquarium and the Woods Hole Oceanographic Institution, stressed the need for action. Several speakers reiterated the need to move beyond a science-based analysis to a risk management approach. Schrag pointed out there is much uncertainty in understanding climate change. The IPCC efforts have been conservative, but scientists now know the earth is warming faster than the previous conservative estimates. Scott Doney, a marine chemist at Woods Hole and another speaker at the symposium, believes it is not change so much as the rate of change that threatens marine ecosystems. “The rate of change we are experiencing is 100 to 1000 times faster than geologic change and threatens to outstrip evolution,” nature’s own means of adaptation. Gary Yohe, Professor of Economics at Wesleyan University, agreed that it is time to shift from high-confidence scientific analysis to management of the risks of climate change. “We need to provide information to people” who can use it to assess the probability of climate change impacts in relation to the consequences of such impacts, said Yohe. He explained that risk management represents a paradigm shift that will enable effective adaptation because it will allow individuals, communities and businesses to identify and address major vulnerabilities to climate change. StormSmart Coasts, a program of the Massachusetts Office of Coastal Zone Management, is an example of this new approach. The program helps communities prepare for and protect themselves from coastal storms and flooding. Overall, the theme of the symposium can be summarized as follows: Climate change is with us – and will be for some time. If we wait for scientists to prove that climate change is responsible for the flooding of low-lying roads, for the spread of invasive species, for the increase in river runoff - then we may have limited options for protecting our coastal waters from the threats represented by a warming world.